NASA astronaut Randy Bresnik, commander of NASA Extreme Environment Mission Operations (NEEMO) 19, during a simulated spacewalk underwater. Astronauts don't typically need to contend with turtles or fish in the middle of a spacewalk. But a team of spacefarers learned how to manage these distractions during a just-finished undersea mission that simulated asteroid exploration. The crew of NASA Extreme Environment Mission Operations 19 (NEEMO 19) lived in the Aquarius lab, which is located 62 feet (19 meters) beneath the waves off the coast of Key Largo, Florida. Their week-long mission concluded Sunday (Sept. 14). "It catches the eye. You certainly admire the beauty of it, but you don't want to get too distracted," Bresnik told Space.com Friday (Sept. 12) from the Aquarius lab. "It isn't too different than regular EVAs, where you have the world going by at six miles a second in the field of view." 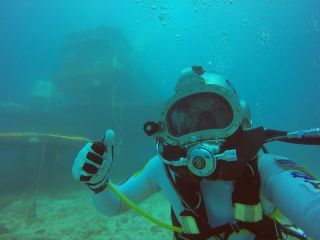 As with predecessor mission NEEMO 18, which ran from July 21-28, the astronauts tested out techniques that could be used to manage communications delays on an asteroid mission. Exploring a space rock about halfway between the Earth and Mars would introduce a 10-minute delay, Bresnik said. NASA is trying out a procedure in which astronauts would complete a circuit of the sites they need to visit on the asteroid, sending the information back to Earth. By the time they return to the first site, communications would have had a chance to travel to and from mission control, letting the astronauts act on any instructions from the ground. This is not just an academic exercise. NASA aims to capture a near-Earth asteroid and drag it into orbit around the moon, where it would be visited by astronauts, perhaps multiple times. The first visit would come by 2025, to meet a directive issued by President Barack Obama in 2010. New technologies are also being tested inside Aquarius. For example, the European Space Agency's "Heads Up" telemonitoring device is designed to work with astronauts equipped with wearable tech such as Google Glass, to show ground controllers what they are working on. The goal is to free up astronauts' hands and to give mission control quicker feedback on crewmembers' activities, officials said. European Space Agency astronaut Andreas Mogensen peers into the Aquarius lab during NASA Extreme Environment Mission Operations (NEEMO) 19 in Sept. 2014. Many aspects of life inside Aquarius are similar to being aboard the space shuttle or the International Space Station, Bresnik said. For instance, space is limited — the living area of Aquarius is equivalent to the inside of a school bus — and the days are long and packed full of procedures. Bringing the astronauts into an isolated environment has advantages over a lab-based simulation because there are certain challenges you can't replicate using computers, Bresnik added. "It's a unique environment, a distracting environment, a dangerous environment [that] really helps make the simulation, that adds stress and challenge to it," he said. The success of the NEEMO 19 mission, he added, is due not only to the crew, but also to the extensive network of supporters such as safety divers, the managers of the Aquarius reef base and Florida International University, which oversees the site. Other members of the NEEMO 19 crew included astronaut Jeremy Hansen (Canadian Space Agency), Andreas Mogensen (European Space Agency) and Herve Stevenin, ESA's head of extravehicular activity at the European Astronaut Centre in Germany. Follow Elizabeth Howell @howellspace, or Space.com @Spacedotcom. We're also on Facebook and Google+. Originally published on Space.com.